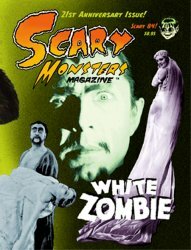 The 84rd Issue of Scary Monsters magazine features new thrills, and scares! It's the 21st Anniversary Issue! Dr. Gangrene's Mad Mumblings: The Dead Walk Among Us! 162 scary pages. All ads, contact information and website addresses appearing in this magazine are no longer in effect. Please direct all inquiries to scarymonsters@mymoviemonsters.com.